The decorative scars on the forehead, the coral necklaces, the plaited hairstyle with concentric rings - usually referred to as the "Ibo hairstyle" - the heart-shaped, slightly-opened mouth and the hole on the top of the head, potentially meant for ivory, are all recurring features of this type of 16 th - to 19 th century Beninese head. The typical iron inlays often used in Benin to emphasise decorative scars are here part of the brass. The latest research (Paula Ben-Amos et al.) interprets this as a trophy head depicting a powerful person who was recently conquered. The conquered king is said to have been decapitated as a symbol of the victor's triumph so that his head could be handed over to the bronze guild in Benin for casting. This brutal course of action was only used in cases of particularly insurgent enemies and was meant to serve as warning to their followers. This head can be identified as a non-native (i.e. not from Benin) in large part because of its layered hairstyle, which was not common amongst the Edo people. It is thus interesting to compare this object with bronze plaques depicting figures with the same style. In our exhibition (2008) alone, six plaques feature protagonists with the "Ibo hairstyle," all either pages, chieftains, warriors or other adjuncts of the king, identifiable as high-ranking members of the royal court by their coral neck jewellery. 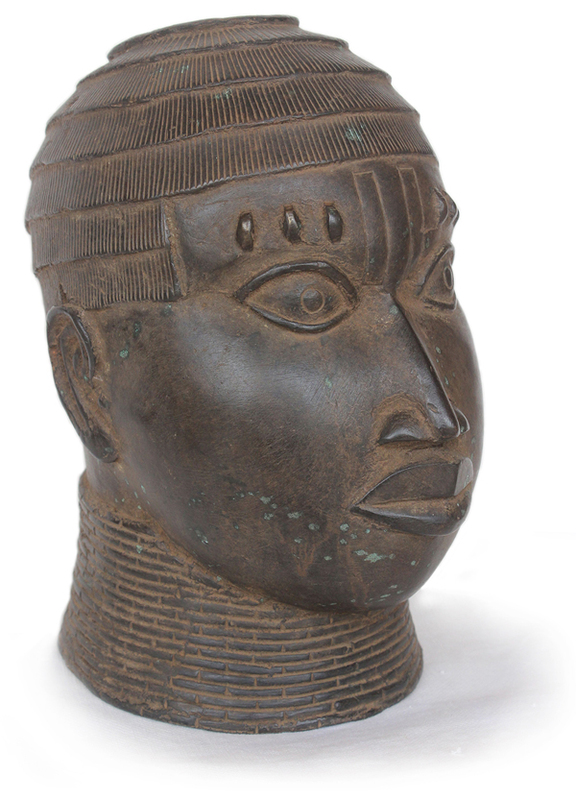 The frequency and context of this hairstyle indicate a firm grounding in Benin's culture, suggesting that the head shown here, which sports that very hairstyle, depicts not a rival or foe, but rather a member of the royal court - perhaps, as Willett suggests, even the king himself. The object dates from the late 18 th to early 19 th century, a period most often designated in the literature as the late period of Beninese art. As Benin's bronze casting tradition is, in fact, 1,000 years old - a contention strongly supported by the Ine of the bronze casters guild in Benin, Chief K. Osarhenhen Inneh - it would be more appropriate to refer to that. Ekpo EYO, Frank WILLETT: Kunstschätze aus Alt-Nigeria, Mainz 1983, S. 136. Paula Girshick BEN-AMOS: The art of Benin, London 1995, S. 26. Philip J. C. DARK: An introduction to Benin art and technology, Oxford 1973, S. 94. Barbara PLANKENSTEINER (Hg. ): Benin. Könige und Rituale. Höfische Kunst aus Nigeria, Wien 2007, S. 373. Felix von LUSCHAN: Die Altertümer von Benin, Band 1-3, Berlin 1919, Tafel 55. Till Förster: Kunst in Afrika, Köln 1988, S. 101. Schätze aus Alt-Nigeria. Ministerium für Kultur, Berlin (Ost) 1985, S. 138. Kunst aus Benin. Afrikanische Meisterwerke aus der Sammlung Hans Meyer, Grassimuseum, Leipzig 2002, S. 73. Augustus Henry PITT-RIVERS: Antique Works of Art from Benin, London 1900 (Reprint 1971), S. 31. Frank WILLETT: Ife. Metropole afrikanischer Kunst, Bergisch Gladbach 1967, S. 189. William B. FAGG: Bildwerke aus Nigeria, München 1963, S. 41.